That’s it. I’ve released my first Grails plugin ever. Woooo! Champagne! If you follow my Twitter feed, you’ve probably noticed that I’ve been playing a lot with Apple Push Notification service lately (APNs for friends). Indeed, ConferenceGuide still requires a data connection, which can be problematic on a lot of events because they’re usually abroad (and roaming fees are waaaaaay too expensive), and even when you do have a data connection, it’s usually pretty slow… at best. That’s probably why one of the most requested features for ConferenceGuide is Offline Mode. But getting all the data directly from the server does have at least one advantage: you’re always up-to-date. And experience has shown that sh** happens: sometimes sessions are cancelled at the last minute, or a global sound mixer reboots out of nowhere, thus shifting all sessions by 15 minutes. Those of you who were at Devoxx last November know what I’m talking about. So I needed a way to combine the best of both worlds: being able to browse schedule and speaker information without a data connection, and still get updates whenever something changes and I can find a wifi hotspot or something. The first part of the solution is the local database. The second part involves sending push notifications. The problem with the latter is that the API provided by Apple is pretty low-level and the documentation is rather scarce. And it’s understandable because they expose a service that should be usable by any server technology, whether it is Java, .Net, PHP, Rails, etc. Fortunately, Java has a huge community and a great Open Source spirit, so it wasn’t long before a few projects were created to build an abstraction layer on top of APNs API. The simplest and most documented one I found is java-apns by Mahmood Ali. But ConferenceGuide server is not plain Java. It’s Grails 1.1 (I haven’t taken the risk to migrate to 1.2 yet). So I wanted to ease the integration of java-apns into any Grails application. And voilà! Grails APNs Plugin. Special thanks to Burt Beckwith for helping me get started, and Mahmood Ali for developing java-apns! Every year, the main reason why I go to Devoxx is to discover new stuff. For me it’s all about technology watch. The internet and RSS feeds are my main tech watch instrument but there is one thing that is harder to get through RSS: feelings. Conferences like Devoxx are a unique opportunity, not only to see what’s happening but also to sense how the community is feeling about it, which is at least as important to anticipate on what’s going to be important. Now you’ve certainly read here and there that there have been a lot of talks about Java EE6 and Closures in JDK 7. There sure were, and there was quite a lot of reactions to those. But frankly, I’m not interested in any of those. I’m not interested in Java EE6 because even though it finally leverages the concepts that have been pushed by the community for so long, the very fact that Sun has been so late in implementing them shows one thing to me: it’s not about them, it’s about us. Sun has been trying to partner with big companies around the JCP, to create a lot of business around those standards. And why were those standards so complex? Because there were so many companies involved in their elaboration? Or was there any interest from those companies to create technologies complicated enough to require a lot of consultants, and books, and trainings, and tools to make things easier? If the first option is true, then how did it happen that a gigantic community of individual software developers made it so that Spring, Hibernate and other Open Source technologies became de facto standards? Which brings me to the second point I don’t really care about: closures in JDK 7. People have taken matters into their own hands. Other languages have appeared implementing some of the missing features of Java: Scala, Groovy, etc. Some other languages have been imported into the Java landscape, like Ruby and Python. I’ve been using Groovy myself for some time now, and I couldn’t be happier with it. Now Sun is coming after the war, but does it matter? What I see here is that it’s good to have a base language, a base platform. But as soon as you start extending it for purely mercantile reasons, or as soon as you start avoiding certain innovations because you’re afraid it might harm your business or the one of your partners, then things go messy. But once again, the good news is that software gives us power. We developers have the ability not only to decide which technology is better, but to build and promote our own technologies. And I think this is why our world is so dynamic and why things change so fast. What I see here is that languages matter less than our ability to create new ones, to solve more specific problems, to provide some more advanced features. And that strengthens my belief that Language-Oriented Programming is the next big step in the evolution of our technologies. Now about the things I do care about. My discoveries. My first one is definitely Kanban. I’ve heard about it for quite some time. But I didn’t understand why people were already trying to push it forward, even though we are still fighting to push companies away from waterfall messes. It’s even more radical than Scrum and for that it’s very interesting because it gets closer to what software development really is. The key phrase that kept popping in my head during the 3-hour session about Kanban was “It’s going to take the time it’s going to take.” And that’s why it’s brilliant. 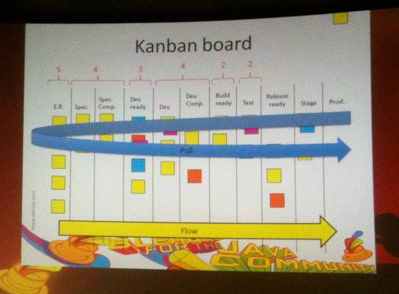 Now that I understand Kanban a little better, I see Scrum as a compromise. We’ve taken some of the principles of Lean Manufacturing, we have dissolved them into trusted concepts like RUP’s iterative cycles. And for years, we have been trying to pour that cocktail into their mouth. And in doing that we forgot something important: if they don’t trust us, they will never drink the whole thing, all the more so as it looks weird with all those colors not really mixed together. The way I see it, Lean and Kanban are all about getting back to the basics, and relying on trust. We have to build trust first, we have to make them understand that at least some of us are not interested in building artificial business on top of poor practices. That at least some of us desperately want the software we build to have a real impact on their business. We have to show them our good will so that they let us do our job. And they have to understand that the more they trust us, the faster we will be, the more we will be able to solve other problems. Big software vendors and resource providers will not like that, because every new project comes with its own overhead, because their business thrives on poor practices, stupid methodologies and complex technologies. But once again, power is in our hands, it lies in collaboration, not in corporation. My second discovery was Spring-Actionscript. Those guys really have a thing to do things in a clever way. Cairngorm, PureMVC, Swiz, they all impose some sort of a structure to your Flex applications, forcing you to surrender some great powers of Flex itself in the process. And here comes Spring-Actionscript, more like a toolbox than a real framework. It doesn’t impose anything. It just gives you all the tools you need, all the glue you miss, to make things fit together perfectly. Their asynchronous abstraction is just brilliant, their configuration options are complete, your code just looks better with it, simpler, more natural. I think that’s what I love most with Spring: not only does it create great technology, but it also instigates a whole pragmatic and elegant way of thinking into the minds of a whole generation of developers, thus encouraging the community to come up with their own technologies: Spring Actionscript used to be called the Prana Framework, developed independently by a Belgian guy who took inspiration in Spring for Java. That’s just awesome. I will definitely integrate Spring Actionscript in a couple of Spring/Flex projects. I think I will even update my todolist sample application with it. Stay tuned. 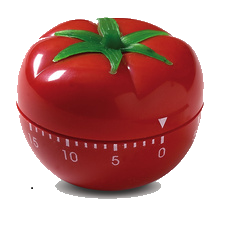 My fourth and last discovery was Pomodoro technique. Once again, heard of it before, but never dug into it. And then we had this guy with a strange Swedish accent in front of us, playing with dolls, showing us handwritten slides with simplistic drawings. And you could hear the disappointed reaction of a lot of people in the room: “sounds nice, but not applicable to me”. That was my first reaction too. Software development requires long slots of concentration because we need time to load the whole conceptual model of what we’re working on into our mind before being effective, and this implies some overhead. But then when someone asked this very question to the speaker, he answered something like “what if you are loading too much? what if limiting the amount of time you are going to spend on a given task forces you to load just the minimum you need to solve the matter at hand? 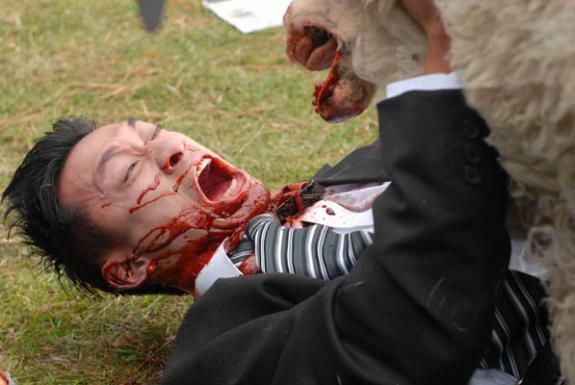 what if it made you more productive?”. And it made me think: “hmmm… It’s worth a try.” So I will probably try that as well soon. Overall, this edition of Devoxx was great! The first 2 days, I was somewhat afraid that it would be disappointing, because you could feel that everything was “cheaper”, that there were less sponsors, less schwag, less tempting hostesses. But then the most important part was preserved: amazing independent content and a great community spirit. Finally there was an interesting special guest this year: Twitter. Twitter was everywhere. People were tweeting live from the sessions, there was a projection board with all devoxx-related tweets in the hallway. I and a bunch of my colleagues were even using twitter to cover Devoxx live for our fellow Axenian java developers on our intranet. Twitter was really everywhere this year. So thanks a lot to Axen for allowing me to go there. Thanks to Stephan and the BeJUG for putting it all together. Thanks to all the great speakers and to my colleagues. This was really a great edition and I can’t wait for the next one. PS: All the talks will be available in the weeks to com on Parleys.com. So stay tuned. I’ve always been distrustful by default with the “main way of thinking”. Which doesn’t mean that I systematically reject the opinion of the majority. But given the strong tendency of human beings towards laziness and our natural tendency to sheep-like behaviour, the faster something gets popular, the more I question it. tests are just more code where there can be other errors, and that need to be maintained. So what about false positives and negatives? I’m still not convinced that ensuring each part of the system is working is supposed to reassure me about the system as a whole. And more importantly, there are other alternative solutions to the same original problems: for example, instead of waiting for tests to fail to fix mistakes, why not trying to avoid them in the first place? We have some pretty good tools for that: refactoring is error-prone, especially when you use a refactoring engine that is not reliable. Then stop using Eclipse, move to IntelliJ. You keep reproducing the same wrong patterns from some old language you’ve worked with for 10 years? How about static analysis? And instead of typing that much error-prone boilerplate code, why not use code generators or dynamic languages like Groovy? I’ve been using all of these tools for years, and I’m gonna say something bold here: I shipped some pretty decent software with not enough bugs to justify the weight of TDD. A craftsman can also go a long way in improving his work by getting better tools, and training himself to use them. Actually that’s what really pisses me off with all the TDD religion thing: too much focus on techniques and processes, not enough on technologies and people. And I think I’m just more interested in the latter two. I thought I had tried TDD enough in the past to avoid the second option, but this morning I attended an amazing talk by Robert C. Martin at Devoxx. In fact, there was another talk before by Ivar Jacobson. And the guy kept talking about software as an industry (comparable to manufacturing for example), about the fact that we have a big professionalism issue (which I totally agree with), and that in his view the best way to fix the problem is to add some theoretical foundations into the mix. Let’s say I didn’t agree at all with his view of where the problem lies, and with his inferiority mix up towards other industries. But on the other hand, I agreed a lot with Uncle Bob’s view of things… until he started talking about how silly it was not to do TDD these days. How can I agree with his conception of where the problem really is, and not with one of the main solutions he proposes. Maybe I’m missing something here. The best way to figure it out is to read in more details what he has to say. And given the incredible energy he showed in his talk this morning, his book is likely to be a lot more interesting than all the TDD manifestoes I’ve read in the past (or tried to read before falling asleep). First off, by january 2010, I’ll be a freelance software architect and developer. After 4 years at Axen, gathering experience, building up my network, figuring out who I am and what I want, this is just the best way to go for me right now. The best way for me to solve real problems in this world. I won’t let anyone down, I’ll do things properly and it won’t happen overnight, but I’m moving on. Which leads me to my second point: I’m actively looking for new challenges, new projects, new problems to solve. Productivity, user experience, mobility, modularity those are the problematics I’d love to help companies with. All things Java, Grails, Flex, iPhone SDK, OSGi, this is my toolbox. High level of intervention, coaching and technical leading, architecture, start-up CTO, those are the roles I’d be happier with. So if you have something along these lines, or simply questions you would like to discuss with a software passionate, my resume is here in English and French, and you can contact me here. So let’s meet, share and… solve problems!